Anchored in the Mercyhurst tradition of excellence, the Athletic Training Department is always looking for ways to refine their craft so students receive the best and most cutting-edge experience. Athletic Training combines science-based knowledge with contemporary evidence-based practices to train majors to treat a variety of populations. From athletes to military personnel to the weekend warrior, athletic trainers learn how to help the physically active get back on their feet following an illness, injury or surgery. Through our decades of educating aspiring future professionals, we have come to understand that it is not the initials after a name that define the work, but rather the impact a person will make. Between hours of hands-on clinical experiences, classroom learning with state-of-the-art equipment, and faculty dedicated to whole-person discovery and development, our graduates leave with the most fulfilling education experience and the skills to lead a successful professional life. An in-demand field, the athletic training profession is expected to grow by 21 percent by 2022 according to the U.S. Bureau of Labor Statistics. Sports Medicine students enrolled in the pre-medical concentration will meet regularly with the university's pre-health advisory committee and the Sports Medicine department to arrange for MCAT preparation, shadowing and the pre-med advisory board interview. Mercyhurst students in this Sports Medicine program are required to complete at least 100 hours of work, service or observation in an appropriate health or medical setting. Opportunities are available for student observation with orthopedic surgeons and Sports Medicine fellowship trained physicians through Orthopedic and Sports Medicine of Erie, P.C. and Lecom Medical Fitness and Wellness Center. The pre-medical student is required to observe one orthopedic surgical procedure. This concentration provides the student with the necessary course pre-requisites and clinical hand-on experience for entrance into a master’s degree in Occupational Therapy. Students who choose this educational pathway will be exposed to the special needs physically active population. This population may include military veterans, pediatric orthopedic patients, head-trauma victims and other orthopedic special needs patients. Pre-occupational Therapy students have clinical observation opportunities at Shriners Hospitals for Children and the Barber National Institute. The Pre-Physical Therapy concentration is a highly competitive option within the Sportsmedicine department for those interested in the field of physical therapy. Students are prepared to gain acceptance into physical therapy doctoral programs across the nation upon graduation through a comprehensive background in allied health science, orthopedic assessment, therapeutic modalities and health and wellness of the physically active population. Upon graduation, this concentration offers guaranteed placement into D'Youville College's Doctoral of Physical Therapy program along with Gannon University's Doctoral of Physical Therapy program. Graduates of this concentration have also attended Univeristy of Pittsburgh and Duke University as well as other Doctoral of Physical Therapy programs across the nation. Pre-physical Therapy students have clinical observation opportunities at UPMC Hamot, Lecom Medical Fitness and Wellness Center, Shriners Hospitals for Children and various private physical therapy clinics. This concentration will provide the student with the necessary course pre-requisites and clinical hands-on experience for entrance into master's degree level Physician Assistants curriculum.The pre-physician assistant student will learn orthopedic evaluation skills and recognition of injuries associated to the physically active individual. Clinical observation opportunities of physician assistants include Orthopedic and Sports Medicine of Erie, P.C. Pre-physician Assistant students graduating from the Sports Medicine Department will have the opportunity for acceptance via six preferential slots into the Physical Assistant Studies Masters Program at Mercyhurst University. Mercyhurst University has applied for Accreditation - Provisional from the Accreditation Review Commission on Education for the Physician Assistant (ARC-PA). 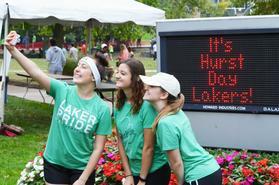 Mercyhurst University anticipates matriculating its first class in June 2014, pending Accreditation - Provisional in March 2014. Accreditation - Provisional is an accreditation status for a new PA program that has not yet enrolled students, but at the time of its initial accreditation review, has demonstrated its preparedness to initiate a program in accordance with the Accreditation Standards. The Physician Assistant allied health profession is an ever-growing specialty in today's medical fields. The Physician Assistant provides medical services to the expanding healthcare population. These services include initial evaluation and assessment of the patient, writing of prescriptions and follow-up care. A physician oversees the healthcare provided by the Physician Assistants. This minor is offered for the student who is majoring in another degree but would still want to pursue the pre-requisites for entrance into a Doctoral of Physical Therapy curriculum. 1. ATS will be able to demonstrate advancing clinical proficiency emphasizing sound principles of clinical research and critical thinking skills culminating into a system of quality patient care. a. Integrate all levels of clinical skills (both didactic and psychomotor) into their various clinical settings. b. Demonstrate the ability to communicate accurately and effectively through listening, speaking, and technology. c. Apply critical thinking and integration of EB decision making in creating quality health care patient plans. 2. Students will demonstrate the ability to synthesize and critically analyze their knowledge in the classroom that ultimately is representative of a qualified professional in the field. a. Demonstrate knowledge in the prevention, diagnosis, immediate care, therapeutic intervention, management, and disposition of injuries and illness. c. Develop cognitive skills of evidence-based practice necessary to employ in decision making. 3. ATS will be prepared to make a difference in the world by demonstrating the common values and behaviors of the AT profession while employing professional excellence and ethical leadership. a. Employ ethical decisions within the scope of professional practice. b. Identify and work respectfully with diverse populations and work environments. c. Participate in professional AT activities at state, regional, and national levels. 4. Students will embody the mercy mission and demonstrate dispositions essential to becoming role models for the athletic training profession. a. Develop a value system based on the standard of expected practice in accordance with the mercy mission and to the athletic training’s professional and ethical standards. b. Demonstrate a sense of leadership and service to others. c. Display a high—level of care and competence to a diverse patient population. d. Develop a high standard of ethical practice with complete understanding of the legal and regulatory practice requirements. 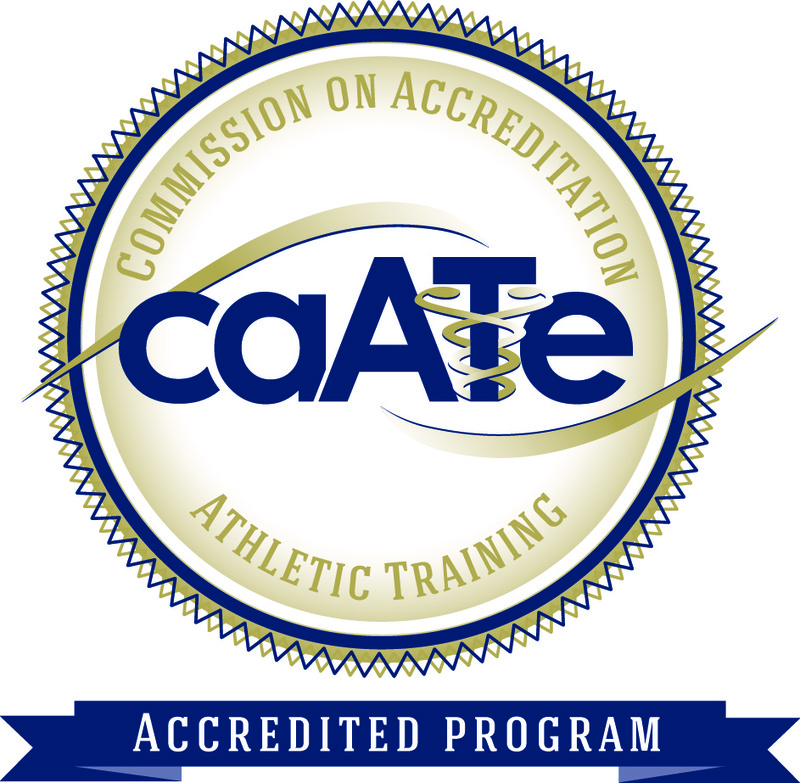 In April of 2010 the athletic training major received re-accreditation through the Commission on Accreditation of Athletic Training Education (CaATe) through 2019/2020. With this accreditation firmly in place the program will prepare you for a variety of entry-level positions in athletic training or to seek advanced degrees in the allied health sciences. In addition to academic course work and vast clinical experiences it will help you develop your ability to think critically, solve problems, communicate effectively and become a complete well rounded clinician and contributing member of society. After completing this program, you’ll be eligible to take the Board of Certification examination to become a certified athletic trainer. The degree requires a minimum of 131 credits. Each course in the specified curriculum (or transfer equivalent) must be included in this total. A GPA of 2.65 must be attained by the end of your freshman year and maintained for graduation. A thorough review board process will be conducted at the end of the freshman year to gain acceptance into the program. The curriculum includes a strong foundation in the basic sciences plus applied scientific knowledge in health care and athletic training. It also includes coursework that will help you develop your ability to think critically, solve problems and communicate effectively. The clinical education sequence begins first term freshman year with the pre-clinical experience. During the freshman year students accumulate 100 hours of direct observation of affiliated athletic trainers. Starting first term sophomore year, student engage in six hands-on clinical experiences and one senior capstone experience involving patients of both genders across 15 diverse clinical settings including high schools, clinics, colleges & universities, professional athletic teams and hospitals. Clinical experiences are progressive in nature and correspond with the curriculum. Because athletic training is a physically, intellectually and psychologically demanding profession, degree candidates must meet minimum standards in certain skills and abilities. The athletic training education program at Mercyhurst university is a rigorous program that places specific requirements and demands on its students. The program has established technical standards to ensure that students have the essential qualities considered necessary for them to achieve the knowledge, skills, and competencies of an entry-level athletic trainer, as well as meet the expectations of the program's accrediting agency. Students must sign the technical standards waiver, and meet these standards in order to be admitted to the program. The Mercyhurst University Athletic Training Program has earned a strong reputation of providing a robust, thorough, and authentic education. 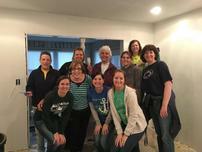 Mercyhurst places an emphasis on preparing students for the progression of the profession through strong clinical skill and professional engagement. Athletic Training Education is continuing to evolve and advance: Per the National Athletic Training Strategic Alliance and updated Commission on Accreditation for Athletic Training Education (CAATE) Standards, the former undergraduate (“Bachelor of Science”) degree in athletic training requires transition to a graduate-level degree in Athletic Training by Fall 2022. Any student interested in becoming a certified athletic trainer will need to obtain a graduate-level degree in athletic training. 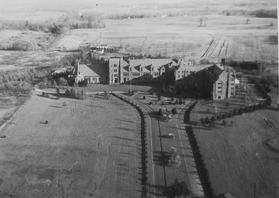 Mercyhurst University will be making this transition. We will be admitting our final undergraduate cohort (BSAT) in the Fall of 2019. As we strive to continue the trend of educating highly-qualified athletic trainers, we will be offering a Master of Science degree in Athletic Training (MSAT), scheduled to begin in Fall 2021 (pending transitional approval from CAATE). Read the full transition statement here. The mission of the professional athletic training program at Mercyhurst University is to provide the student with the necessary didactic, theoretical, and clinical skills and experiences required to qualify for the BOC examination. In the spirit of the core values of Mercyhurst University, athletic training students shall achieve this by becoming self-aware, culturally competent, and ethical healthcare professionals prepared to enter the allied health field. The Mercyhurst University professional athletic training program aspires to offer an extensive academic and clinical experience with devoted faculty to ensure the professional and personal growth of each student pursuing BOC certification. Students can participate in a yearly medical mission trip to Valladolid, Mexico to observe and work with orthopedic surgeons, athletic trainers and physical therapists in a culturally immersive setting. Our students receive placement in a variety of settings for a robust patient population experience, including high schools, D1 men's and women's hockey, D2 intercollegiate athletics, PT/OT clinics, VA hospitals, ambulance ride-alongs and pediatrics. Our graduates have found rewarding careers within the AT profession and beyond. AT alumni include a professor/researcher on pediatric concussions and orthopedic injuries, an orthopedic surgeon, a clinical athletic trainer, and the Duke University assistant director of athletic rehabilitation. Accepted students must become members of the NATA ($80 approximate cost per year) and possess a current American Red Cross Professional Rescuer certification ($15 approximate cost per year). Students are responsible for all costs associated with transportation to and from their clinical sites. 1. The mental capacity to assimilate, analyze, synthesize, integrate concepts and problem solve to formulate assessment and therapeutic judgments and to be able to distinguish deviations from the norm. 2. Sufficient postural and neuromuscular control, sensory function, and coordination to perform appropriate physical examinations using accepted techniques; and accurately, safely, and efficiently use equipment and materials during the assessment and treatment of patients. 3. The ability to communicate effectively and sensitively with patients and colleagues, including individuals from different cultural and social backgrounds; this includes, but is not limited to, the ability to establish rapport with patients and communicate judgments and treatment information effectively. Students must be able to understand and speak the English language at a level consistent with the competent professional practice. 4. The ability to record the physical examination results and treatment plan clearly and accurately. 6. The perseverance, diligence, and commitment to complete the athletic training education program as outlined and sequenced. Candidates for selection to the athletic training educational program will be required to verify they understand and meet these technical standards; or they believe that, with certain accommodations, they can meet these technical standards. The Mercyhurst University ADA representative will evaluate a student who states he/she could meet the program’s technical standards with accommodation and confirm that the stated condition qualifies as a disability under applicable laws. If a student states he/she can meet the technical standards with accommodation, Mercyhurst University will determine whether it agrees that the student can meet the technical standards with reasonable accommodation; this includes a review of whether the accommodations requested are reasonable, taking into account whether accommodation would jeopardize clinician/patient safety, or the educational process of the student or the institution, including all course work, clinical experiences and internships deemed essential to graduation. Note: Students must sign the Technical Standards Waiver Form indicating their understanding of this policy.